It feels as though today has been the first properly sunny day in London all year, so I went out into Southwark park this afternoon to capture one of my favourite spring flowers the crocus. Having admired them in a friends’ garden yesterday, I dug out my RHS Encyclopedia of Herbs and found myself dreaming of one of my favourite Spanish dishes, Paella! What’s the connection, you might ask? The prized and costly spice, saffron, which gives Paella its beautiful colour, flavour and aroma, comes from a relative of the crocuses we see blooming all over our parks and gardens every Spring, the Saffron Crocus or Crocus sativus. It’s the slender thread-like styles which are found at the centre of this autumn-flowering plant, which, when harvested and cured, produce the beautiful brick-red threads which sell at around £8 per gram or more in UK supermarkets. It’s estimated that it takes around 150,000 flowers and 400 hours’ work to produce 1kg of dried saffron, so it’s just as well it only takes a tiny amount to impart lots of flavour and colour to any dish! Throughout the ages, growers and traders have been tempted by high prices to adulterate saffron with cheaper alternatives, and in 15th Century Nuremberg, people caught adulterating saffron were liable to be burnt at the stake or buried alive with their adulterated produce! The town, Saffron Walden, just north of London, was once famous for growing the spice, which also used to be prized as a dye, not only for cloth, which it turned a golden yellow, but also for ladies’ hair and men’s beards! Today, saffron is primarily used as a culinary spice and the bulk of it is grown in Iran, Azerbaijan, Kashmir and Spain. However, the Chinese still value it as a medicinal herb, particularly for “stagnant liver energy” and it is known to stimulate menstruation, increase perspiration and generally aid digestion. Medicinal use is contraindicated in pregnancy. Saffron contains crocetin, a carotenoid which – most unusually – can be dissolved both in water and fat. This is due to the fact that it occurs as a glycoside. Crocetin is a powerful anti-oxidant and is responsible for most of the orange colour in saffron. 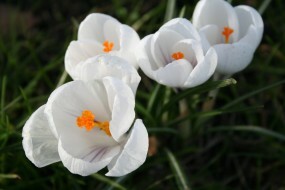 Saffron also contains a volatile oil, bitter glycosides, and vitamins B1 and B2. Safety notes: Even if one could afford to buy large amounts (! ), saffron is best consumed in the tiny quantities called for in traditional recipes such as Paella etc. To avoid adulterated products, it’s always best to buy saffron in whole threads and from reputable sellers. Don’t be tempted to forage for saffron in parks and gardens across the UK as the saffron crocus can easily be confused with other poisonous plants such as Meadow Saffron (Colchicum autumnale), which also flowers in Autumn. If you want to grow some Saffron Crocus yourself, it’s best to buy from experts in medicinal and culinary plants such as Poyntzfield Nursery. Brown, D. (2008) The Royal Horticultural Society Encyclopedia of Herbs. London: Dorling Kindersley. Chevallier A. (2000) Encyclopedia of Herbal Medicine’ (2nd ed.). NY: Dorling Kindersley. Ganora, L. (2009) Herbal Constituents: Foundations of Phytochemistry. Louisville, Colorado: Herbalchem Press. Grieve, M. (1971) A Modern Herbal. New York: Dover Publications. Onstad, D. (2004) Whole Foods Companion. White River Junction: Chelsea Green Publishing Company.